Micro four-thirds cameras are by and large already quite small but the GM1 must rate as one of the smallest, and with its new shorter-range 12-32mm f3.5-5.6 pancake-type (retractable) zoom this camera will fit a coat pocket. The body shape is arguably reminiscent of a Leica, at least from the front, sides and top. It even has its own screw-on handgrip with baseplate, as a $100 option. Apart from the small size and low weight of just 204g (7.20 oz) it features a similar 16-Mpix Live MOS type sensor with sensitivity of ISO 200-25,600 as the firm’s high-end GX7. But it lacks that model’s stabilized platform, and there’s no phase-detect AF option. However, low light detection using the contrast detection AF system ranges from an impressively low Ev -4 to 18. A high-speed shutter option of up to 1/16,000th at up to an impressive 40fps at full resolution is due to an electronic gating option; otherwise using both mechanical curtains the maximum shutter speed is a more modest 1/4000th sec with a 5fps burst mode. While it lacks the option for an EVF (or optical finder) the rear LCD is a large 3-inch high-resolution touch screen panel though it’s a fixed design, as you might expect in a small camera like this. Full HD (1920 x 1080i) video recording is possible in various shooting modes and in both NTSC (60/30/24p) and PAL (50/25/24p) regions, using both AVCHD and MP4 formats (albeit, with some limitations). 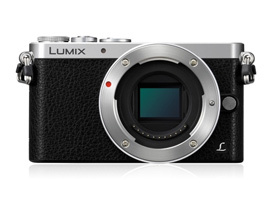 The Lumix DMC-GM1 is available now in black or silver at $749 complete with the new retractable and stabilized 12-32mm f3.5-5.6 ASPH Mega OIS zoom. 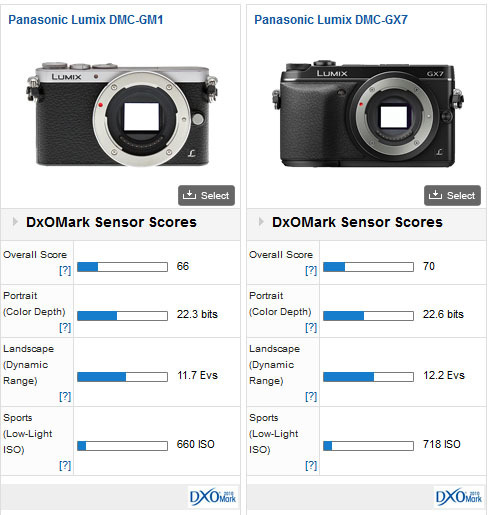 The Lumix GM1 achieves a DxOMark score of 66 points and is ranked in 98th place overall above the firm’s respected, but no longer made GH1 model. If that doesn’t sound impressive the GM1 above most others of the same format, save for the most recent, high-end models such as the E-M1, E-M5 and GH-3. 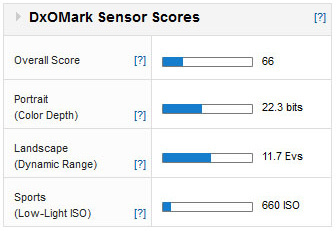 It’s also only one point over the APS-C Canon EOS M and EOS Rebel T3i (600D). The Olympus OM-D E-M1 has the best color depth at 23-bits of the MFT cameras and the widest DR, a stop more than this new model. The GX7 has a + 1/2 stop advantage in DR.
Low light performance is around -1/2 stop down on the best MFT cameras in our database, and around -1/4 stop lower than the Panasonic GX7. Against similar rivals in the marketplace the GM1 outperforms the Nikon 1 J3 with its smaller 1-inch type sensor by 14 points, or the equivalent of around +1 stop in image quality. The Panasonic has more than 1 stop better color discrimination compared to the Nikon at base sensitivity, and just over +2/3 stop more dynamic range. And it’s no surprise to see the Lumix better the smaller chip by around +1/2 stop in low light performance. 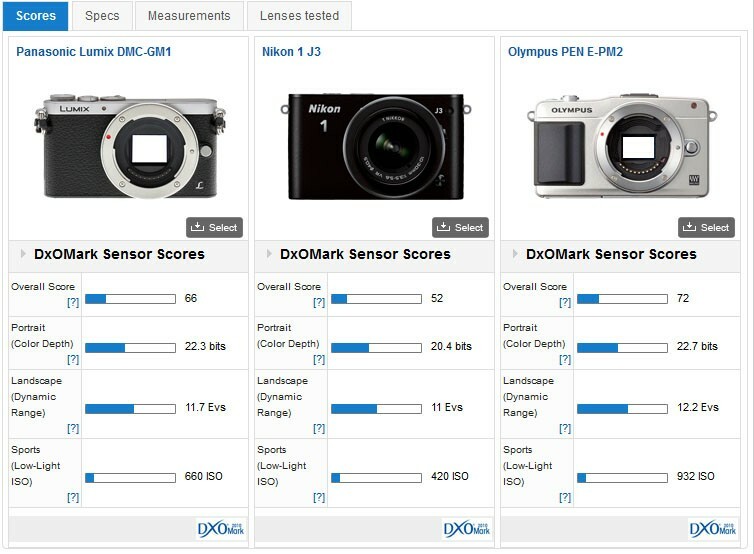 Side-by-side with the 16-Mpix Olympus PEN E-PM2, which was launched alongside the E-PL5 at Photokina last year, the Lumix is around -1/3 stop behind in IQ overall. This can be broken down individually as having a -1/3 stop less color depth, -1/2 stop less exposure range (DR), and quite a noticeable -2/3-stop disadvantage in low light capability. That’s not quite as discouraging as it sounds, as in low light the E-PM2 is sport the best performing MFT sensor model in our database. While it’s slightly disappointing that the sensor in the GM1 can’t match that of the GX7, the former is a few bucks south of $1000 body only. Nevertheless it has competitive image quality in a genuinely small package and the usefulness of the high-speed shutter shouldn’t be overlooked. Paired with the new zoom or the 20mm f1.7 pancake, the GM1 should prove popular as a walkabout.